I had my facts all wrong about Pavlova; it’s not Russian, but named after a Russian ballerina, Anna Pavlova. There’s a great debate about who made it first; Australia or New Zealand, but lets just focus on the fact that there is Russian inspiration here!! 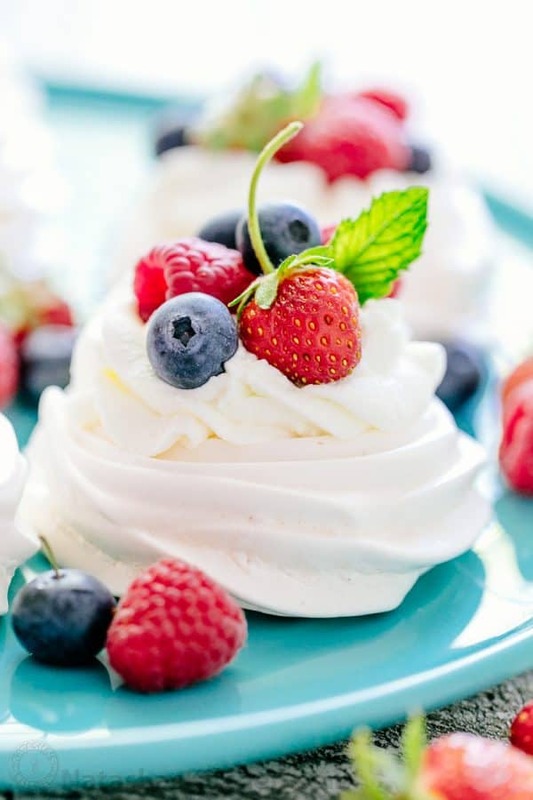 The Pavlova is graceful, beautiful, and romantic; a perfect dessert for your valentine or dinner guests! 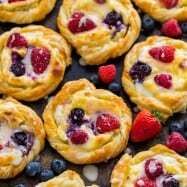 It’s crisp on the outside with marshmallowy goodness on the inside, piled high with fluffy cream and loads of fresh fruit. If your egg whites are not at room temperature, place them in a bowl and set over a second bowl of warm (not hot) water for 15 minutes. 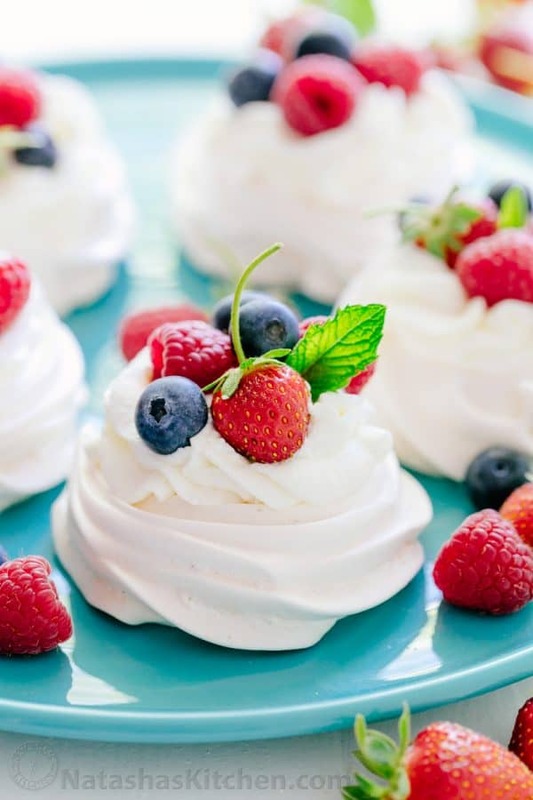 This recipe is easy and you can make the meringues up to 3 days ahead of time and store loosely wrapped in a plastic bag then assemble just before your event. 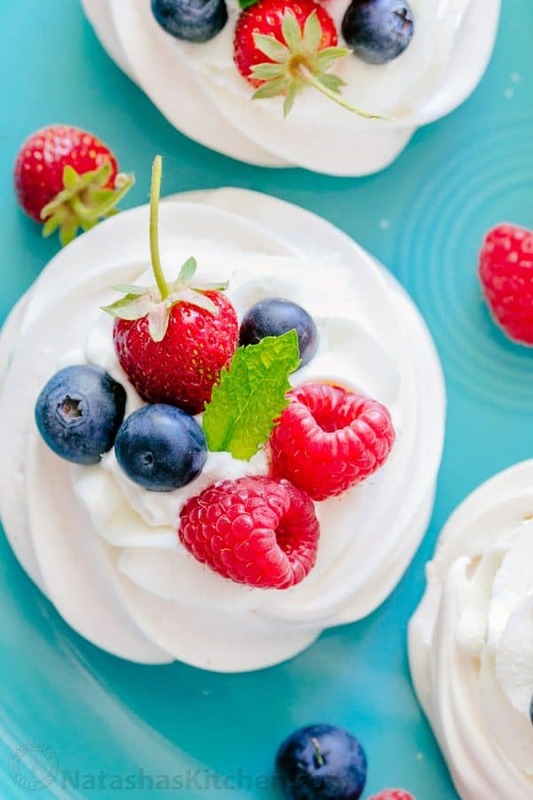 Have you tried the Pavlova? What are YOUR favorite toppings? Hi just wanting to check if the measurements are in metric or imperial? 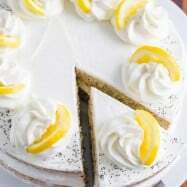 Hello, tried this recipe and few days ago and was so shocked that it did not turn out! Everything I try on Natashaskitchen.com turns out great but this was a complete disaster. Something went wrong and I have no idea why! My sister said hers didn’t turn out too. Was wondering if substituting the white granulated sugar with icing (powdered) sugar would change the structure of the pavlova. I ended up starting all over and the second batch peaked almost immediately. I think my egg whites were too cold, and who knows what else. Hi Natasha. I just made these and they are so tasty! But they came out crispy on the outside and the inside too instead of marshmallow consistency. Hi, Natasha, my name is Rebecca! I had a question concerning the pavlovas! 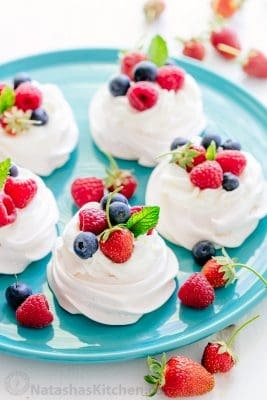 I am planning to make them today for a party tomorrow, would you suggest me to make the pavlovas tonight and put whipping cream on them tomorrow? The party is at 4:00 pm should I put the cream around 1? I just don’t want them to melt very fast! if you can let me know ASAP that would be great! I want to make this today, but could you please tell me how much it will be 1.5 cups of sugar in grams? Any recommendations for the use of egg yolks? Do you have any recipe I could use? I just made these and they are quite tasty! However, mine were crisp all the way through and the surfaces cracked. I live in Denver. Could the altitude be my problem since the times/temps listed were followed exactly? I have 8 egg whites that are already together. What kind of modifications do you think I need to do to make it work, if that’s possible? 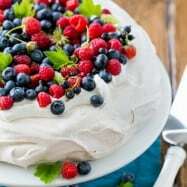 I try to make pavlova but I can’t.I mad ingredients as you said and ordered the inside of the oven according to the length of time .It’s so bad and very Crisp and fragille .Can you help me about that? Can these be made a day in advance ? If it can . would you put in the fridge over night? I want to make sure the bottom layer stays crispy. Hi, Natasha! I’m making these now and have to use two different baking sheets to fit into my oven. Can I bake both at the same time? How should I position them in the oven? I mixed it until there were stiff peaks. It only softened after adding the vanilla and lemon juice. I would like to be able to try this again with success! Your recipe was amazing,I mean the egg white batter was just so pretty and it looked like it’s going to be the the perfect mini pavlova,But then I had to go somewhere in an emergency without baking the pavlova.I left the house at 5:30 pm and I only returned at 11:30 am (the next day) and when I came back and took a look at the batter,I tried to beat it and stuff and now It has all soft peaks and it isn’t holding it’s shape at all. How large do you normally pipe them? I’m making them for the first time this weekend for an office Valentine’s dessert event. I’m very excited because I love pavlovas, but also nervous. I’ve been revisiting the recipe this whole week. Also, is it okay to store the whip cream in the piping bag (in a container) until I prepare the pavlovas? I don’t generally have whip cream so I am very unfamiliar! 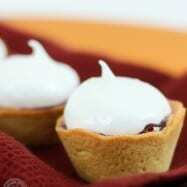 Can the meringues be made 2 days in advance? How should I store them? Air tight container at room temp? Hi Natasha. Love all of your recipes! Thank you so much! I made these pavlovas and they turned out absolutely delicious. Everyone loved them! We ate them within 3 hours and the whipping cream frosting was starting to run. Perhaps it was warm in the room. I would like to make them again. Is there a way that they can be made in advance and hold up better? Can I assemble them and put them in the fridge for about 4 hours before serving? Or will frosting get runny? Hi, my oven is a little small and won’t fit two regular baking sheets side by side. I’d like to know if I can use the same meringue recipe and to make it just like s cookie with no whipped cream topping. Also can I add a few drops of purple emulsion to make them lavender? Thank you! Hi Natasha, I have a quick question. 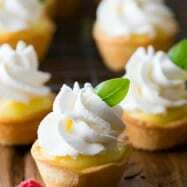 Is it possible to use a piping bag to make a pretty outer design,then make a little indent for the cream? I’ve made these once before but smaller size so that I would have more than 8 and they weren’t good at all, they were hard. Looks great! 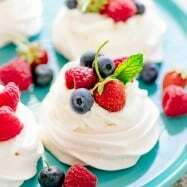 Does pavlova taste similar to Bolco dose? I made these and the tops of them turned out all cracked. Is there a reason for this? That’s awesome that you will be starting work. With this economy it’s hard for RN’s in the valley to get hired. Even though there is a need for RN’s the hospitals can’t afford them and over work nurse’s, at least where my husband works. I grew up eating this delight. Being Australian I can attest to ensuring the eggs are at least room temperature, in fact the best results are often achieved with the eggs at 35C or greater . Just soak them in a bowl of warm water for a while as Natasha suggests. You can also change the overall flavour by replacing the vanilla extract with a liquor and the match your topping to the base flavour. I like to use a coffee liquor and then a chocolate desert topping with cherries. Another serving suggestion is to make one large round Pavlova with a well in the centre and a rim of approximately 1″. This way you can fill the centre with yummy whipped cream and whatever fruits you wish. As a child we simply used canned fruit salad or Kiwi fruits with some grated chocolate over top and a light dusting of icing sugar.